Digital accounted for 72.3% of video revenues in the UK in 2018, but DVD and Blu-ray are still important for delivering the top-selling titles, according to trade body the ERA. The Entertainment Retailer’s Association year-end figures show that last year UK digital video revenues were up 26% year-on-year to £1.689 billion, driven by streaming services like Netflix, Amazon Prime and Sky’s Now TV, as well downloads from Amazon, Apple and the Sky Store. By contrast, physical retail sales were down 16.9% at £616.9 million, while physical video rentals were down 27.7% at £31.7 million. Despite this, the best-selling film-to-own in 2018 was Hollywood musical The Greatest Showman, which sold 2.69m units – 71.3% of them on DVD or Blu-ray disc. The ERA found that of the top 20 films-to-own last year, an average of 74.1% of sales were from physical formats. “Video was arguably entertainment’s most dynamic sector in 2018,” said ERA CEO, Kim Bayley. “Streaming services have transformed the viewing choices of the British public by offering 24/7 access and convenience. 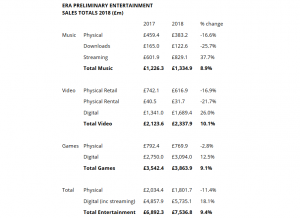 Overall, physical and digital video revenues reached £2.338 billion in 2018, putting the market 7.4% ahead of its 2012 low-point but still “well below” its historic 2004 high of £2.953 billion. 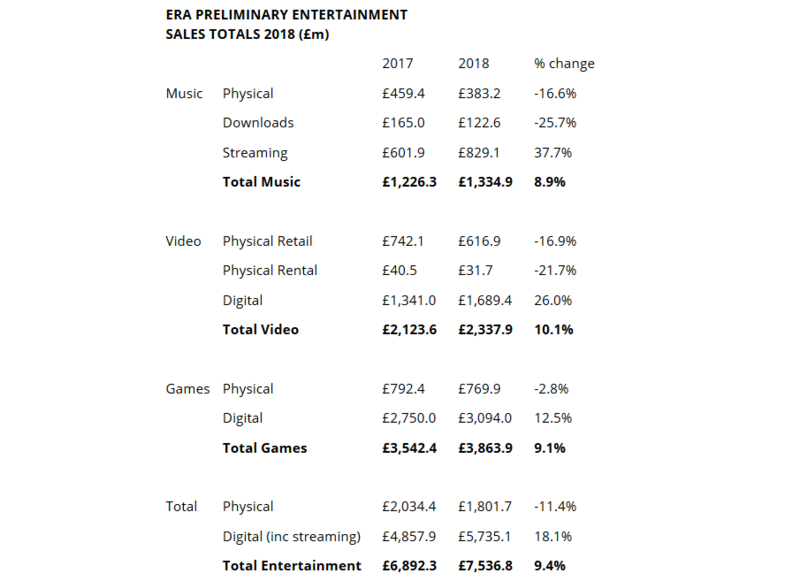 Across all entertainment categories – video, music and games – total physical and digital revenues were up 9.4% year-on-year at £7.537 billion, with the games sector heralded by the ERA as the “biggest winner in digital entertainment’s digital transformation”. For the first time in 2018, games were found to account for more than half of the entire UK entertainment market at 51.3% – some £3.864 billion across physical and digital. This was thanks to growth areas like direct-to-console downloads and mobile and social gaming.